Cinnamon Essential Oil is peppery, earthy, spicy, bright yet slightly woodsy. 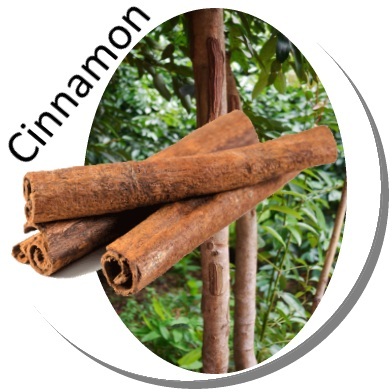 Oil distilled from the bark of the cinnamon tree is preferred over the oil distilled from the leaves. o Blends well with cloves, coriander, frankincense, ginger, grapefruit, lavender, rosemary and thyme. o Ancient Egyptians used cinnamon as a foot massage oil. o Other uses by the Egyptians included using cinnamon as a remedy for excessive bile. o Traditional use of cinnamon also included using it as a sedative for birthing mothers and as an ingredient in mulled wine; cinnamon was a traditional ingredient of love potions and incense. o Constipation, exhaustion, flatulence, lice, low blood pressure, rheumatism, scabies, stress. o Use for treating a variety of health disorders including respiratory problems, skin infections, blood impurity, menstruation problems, heart disorders. o High dosages can cause convulsions.The leaf oil should be avoided during pregnancy, while the essential oil extracted from cinnamon bark should be avoided in total, as it is considered to be a dermal toxin, irritant and sensitizer. o Cinnamon aids in the circulation of blood due to the presence of a blood thinning compound in it. This blood circulation helps significantly in removing pain. Good blood circulation also ensures oxygen supply to the body cells leading to higher metabolic activity. o As with the above, cinnamon oil can help with digestion, rheumatism and arthritic pain. It helps to fight colds and flu when used in the formulation of a cream or lotion.